Worship leaders and teams spend countless hours and and significant dollars on tools and training events to create awesome worship services. But there's one tool that most worship leaders fail to think about: the song list. Every church has one. The typical church's master song list is often a "monster list." It contains hundreds of songs: the songs the church currently sings, used to sing, and a bunch they've forgotten. Introduce new songs in a way that stick with your team and your congregation. Get more life and impact out of your songs by having an intentional system to rotate songs. Gain more time by streamlining your planning process. Make more room for great songs by knowing when to retire songs that no longer resonate with your church. Create more consistency from Sunday to Sunday, especially when your church uses multiple leaders and teams. Give your team a chance to truly learn the songs they are leading. The extra confidence and freedom will help them model worship like never before. Help your congregation engage in worship by limiting your active song catalog. The better they know the songs, the better they can engage. It's got short chapters that you can easily reference as you need them. It has a Quick Start Guide for you leaders who don't want to read the whole book. 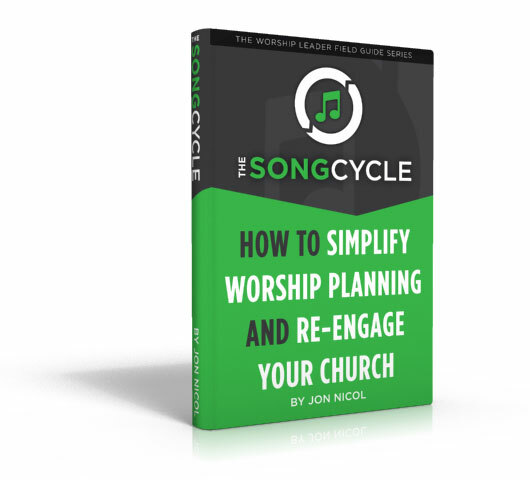 You'll also be given access to the The SongCycle Workbook, a $29 value. The workbook contains worksheets and tips for creating your own SongCycle. Purchase The SongCycle Book Today! 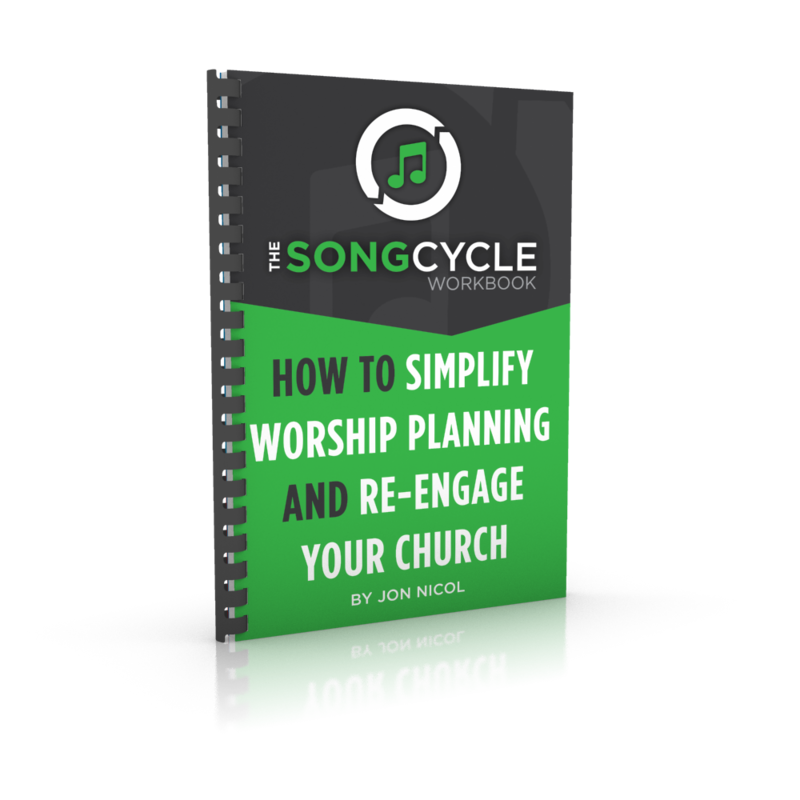 The SongCycle can work for traditional churches and contemporary churches, small churches and mammoth churches, and churches with multiple full-time worship staff and those that are led by one volunteer. Your song list is a huge part of your church's language of worship, as well as a teacher of doctrine and theology. You need a system to make your song list the best it can be. The SongCycle will walk you step-by-step as you create and refine a life-giving song list. Being a relatively new worship leader, I've been slowly developing my own "song cycle system" through trial and error. Thankfully, Jon has produced an excellent, well-developed, and time-tested approach to worship set list selection and rotation. My guess is that even seasoned worship leaders will gain useful insights from Jon's system. I love Jon's conversational writing style, and I even laughed aloud a few times due to his fun anecdotes. There is a lot of meat packed into this guide - Jon doesn't just throw his system at you and tell you how to implement it. Instead he deliberately highlights the need for such a system and thoroughly explains each component. As I write this review, I have all my binders of chord charts out and strewn across the floor as I eagerly begin to implement the SongCycle. I look forward to seeing how the Lord will use it and pray that our worship time is enriched as a result. I ran across this book by accident while looking for resources to help with my process of selecting and introducing new music for worship. I fully expected this book to be a good resource with a textbook like feel. To my delight I found that I was quickly smirking, chuckling and finally bursting out with honest laugh-out-loud laughter. Jon has an excellent writing style full of whit that engages readers and encourages a full read through of the material. This is NOT a boring read. The SongCycle is truly an excellent resource for worship leaders desperate to get a grasp on their ever expanding music catalogs. Jon also provides wisdom and insight in areas that often trouble worship leaders such as encouraging congregations to engage in worship and the introduction of new music while honoring past classics. When i finished SongCycle I felt as if I had been in an concentrated micro-mentoring session with this experience worship pastor. I fully intend to implement the principles behind the SongCycle system into the way I schedule worship songs and introduce new material. Thank you Jon for writing this book!